Unlimited Blade Works is not the Fate/Stay Night anime you remember. The plot is full of new twists and turns and it comes with a visual upgrade that puts other big budget TV anime to shame. Fate/Stay Night: Unlimited Blade Works is the story of a secret tournament between seven chosen mages that happens in the shadows of our modern day world. Each mage is paired with a legendary figure from myth or history and the last pair standing receives the ultimate prize: the wish-granting Holy Grail. Thus enter the two leads: Shiro, a normal high school boy with only the most minor of magical abilities and Rin, a young but powerful mage from the same school. After Shiro accidentally becomes a contender for the Grail when he is paired with noble female knight “Saber,” Rin and her pragmatic partner “Archer” decide to ally with him to defeat the other teams—lest they risk the Grail falling into far more devious hands. Let's get the obvious out of the way first: Unlimited Blade Works' high point is its visuals. They are stunning with their brilliant use of color and exquisite detail. In fact, I can say honestly and without hyperbole that it is the most beautiful-looking television anime series I have ever seen. Every frame of the show seems to have perfect polish. There are no derpy eyes or loose animation to be found, like in everything from One Piece to Gundam. Even when characters are far in the background, they still have a level of detail far beyond the accepted standard for TV anime. And while Ufotable, the studio behind Unlimited Blade Works, is known for great-looking anime, this surpasses even their other works. However, the visuals are far from the end all be all of Unlimited Blade Works. It delivers in the story department as well. As alluded to at the review's start, Unlimited Blade Works is not the first Fate/Stay Night anime—far from it, in fact. Since the original anime—titled simply Fate/Stay Night—aired in 2006, there has been a film, a prequel anime, and a spin-off anime. However, Unlimited Blade Works is not a sequel, prequel or spin-off—nor even a remake of the original anime. Instead, it is a different version of how the original's story can unfold. Fate/Stay Night is an adaptation of a 2004 visual novel—a choose your own adventure novel-like game with graphics and voice acting. Most visual novels have several routes through each story—each one often corresponding to the character that the player chooses to romance. In the Fate/Stay Night visual novel, there are three ways the story can unfold. The 2006 anime was based largely on the storyline where Shiro falls in love with Saber. Unlimited Blade Works is the version where Rin serves as the romantic foil instead. What's great about Unlimited Blade Works is how different it is from the 2006 anime. The setup is the same and all the players competing for the Holy Grail are identical. Shiro and Saber are still partners and they once again agree to team up with Rin and Archer, but the tiny choices Shiro makes wildly alter how the story plays out. At first, the differences seem minor and can be hard to spot. But by the cliffhanger ending of the first half (the second half of the anime will be airing this spring), the plotline has shifted so radically that it’s impossible to predict what will happen next. However, while the way the plot unfolds is new and exciting, the fact that the setup to the story is identical to the 2006 anime does have some drawbacks. If you have seen the original Fate/Stay Night anime (or the prequel series Fate/Zero), much of the major lore and revelations—e.g., the true nature of the Grail and Kirei's various secrets—are already spoiled for you. It can be somewhat monotonous watching the characters try to figure out those mysteries. Conversely, this can also be seen as a point in the anime's favor as Unlimited Blade Works does not assume you have seen either the first TV anime adaptation or Fate/Zero and is thus a great starting point for anyone new to the franchise. Not including long-running anime like One Piece or Detective Conan, most anime these days either run 12-13 episodes or 24-26 episodes. Each anime must therefore complete its story in these given time frames. These set limits are why pacing can be such an issue in anime adaptations; there is often either too much story to tell in the number of episodes available (so everything feels hectically rushed) or not enough story to fill the episodes (and the anime becomes painfully drawn out). At a glance, Unlimited Blade Works seems to follow this pattern (as its first half is also technically 13 episodes long). However, it has some hidden runtime that helps the anime sidestep this problem. There is an hour-long “zero” episode that spends its time following Rin and setting up her circumstances and character. Then there are two other hour-long episodes within the series as well. This additional runtime allows the anime overall to have nearly perfect pacing: It is exactly as long as it needs to be to tell the story it wants to tell. The show never feels uselessly drawn out or overly rushed. 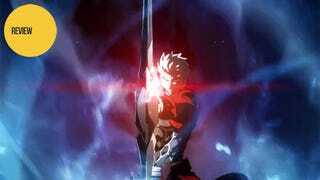 Fate/Stay Night: Unlimited Blade Works stands tall among the best of the fall anime season. It is an excellent alternate version of a popular story filled with new twists and turns that will engross fans and newcomers alike. It has marvelous action, well-developed characters, and visuals that are simply without equal. Fate/Stay Night: Unlimited Blade Works is not to be missed. Fate/Stay Night: Unlimited Blade Works aired on Tokyo MX in Japan. It is currently available for free and with English subtitles on Crunchyroll and Hulu. The second half of the anime will be airing this spring.